This article is for Democratic voters. You Republicans can go somewhere else. I first met Hillary at the beginning of the 1992 Presidential campaign. I went very early to an event where she was to appear and got a front row seat. I was absolutely blown away. She spoke without any notes, yet there were no "ums" or stumbles. The breadth of her knowledge was incredible, and she spoke about substantive issues. She answered questions authoritatively. That's when I became a Hillary girl, and in 1992 and 1996, I voted for Hillary's husband. Later that election, my daughter had a friend tell her that Bill & Hillary Clinton and Al & Tipper Gore were going to be eating at a restaurant where he worked, but the public didn't know it. My daughter arranged to be eating dinner there that night. When she told me, I told her it was Bill Clinton's birthday, which was not widely known. When they walked in the restaurant, she wished him a happy birthday. Bill was thrilled, and my daughter got to talk to them and got all four autographs on a napkin from the restaurant. That's when my daughter became a second generation Hillary girl. 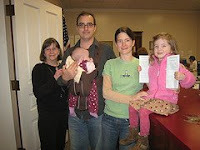 And just recently, I went with my daughter and her husband to our courthouse, so they could vote absentee. When we walked in, my three year old granddaughter announced to everyone, "We're here to vote for Hillary Clinton!" Thus, we have our third generation Hillary girl. I've been closely following Hillary ever since I met her, and I've read everything I can about her. When she declared she would run for President, I was thrilled. On behalf of my daughter and my four granddaughters, I believe it is very important that a woman becomes President of our country. Women have been second class citizens throughout our history. Although we have made great advances, we still have a long way to go. No one thing would further that cause more than electing a female President to serve as a role model for young girls. However, since women have always had to do a job much better than a man to get any credit, that woman must be an excellent President - and I believe Hillary will make an excellent President. There are several issues that concern me, but the most crucial is the role of our country in the world. The current President has single handedly destroyed our reputation worldwide, and Hillary has the knowledge and experience in foreign affairs that will be essential to restore our image abroad. Plus, she is one tough cookie and will not be taken lightly by anyone - and we can trust her to be our Commander in Chief. Another Bush legacy is the financial disaster that is our economy. Bush inherited an unheard of surplus, and he has turned it into an unheard of deficit. We are indebted to China and other scary countries. The dollar is no longer respected abroad. The income gap between rich and poor is larger than it's been in this country since the age of the Robber Barons, and the middle class is disappearing. One of my favorite Hillary quotes goes something like "It took a Clinton to fix the economy after the first Bush. It may take another Clinton to fix it after the second Bush." It will take an experienced person to pull off this challenge. There's a reason why the working class is voting overwhelmingly for Hillary - they are the ones suffering now. The wealthy and the young can afford to vote for charisma - the rest of us need solutions. Without a doubt, the biggest immediate crisis in our country is health care. Not only is it devastating for individuals, but it is breaking the finances of local, state, and national governments. It is bankrupting businesses and keeping American companies from being competitive with foreign ones. Also, it keeps untold people from going into business for themselves because they can't give up their health benefits. Those who are knowledgeable about health care can tell you there is a world of difference between the two Democratic candidates on this issue. Hillary, a real expert, is the only candidate that will provide universal health care - that means everyone has coverage. Anything less is just a band aid and will not work. Finally, Bush has destroyed the regulatory system of our federal government, so that we can no longer depend on the safety of food, drugs, bridges, etc; no longer expect the federal government to be able to respond to a disaster; no longer believe the research coming from federal agencies; no longer trust the words of the CIA; and no longer provide health care and support to the veterans who sacrificed for us. A President must understand how Washington works in order to repair our dysfunctional bureaucracy. By that I don't mean corruption and cronyism, but understanding the protocols and rules that have been in place for years. Hillary understands it well, especially as she suffered from her naivete when she first tried to reform health care. Obama is a very impressive candidate. My concern with him is that he is an unknown, and I don't think we can afford a gamble right now. I much prefer that he runs as Vice President with Hillary, where he can gain experience and we can get to know him. Hillary is the best choice for Mississippi Democrats on Tuesday, March 11. Thank you, Casey, for that wonderful analysis of our current National dilemma. I, too, support Hillary and hope and pray she wins the nomination. What more can I say. You said it all and thank you! P.S. : I voted for the first Bush but thankfully recognized the fallacy of the second one. Hill Yeah! I am also voting for Hillary. We need someone who can win against McCain. Republicans have said they would rather have Obama as the other candidate, because they know Hillary is a tough contender. She has proven already she will fight for every American no matter what it takes. Many counted her out but she has fought her way back with tenacity and guts. This is what it takes to be President of the United States. Isn't it time we have someone who is not only respected by other countries, but who is trusted by them also? It's time for a woman in the White House. It's time for a president with knowledge, sincerity, and experience. Anyone in or around Jackson (or willing to make the drive) is invited to join the Hillary Clinton Meetup group. We are having a meeting at 6:00 p.m., Wednesday, March 5, at Barnes & Noble, at 1057 E. County Line Road, in Jackson. All are welcome. The "somewhere else" Republicans can go to wouldn't be a four letter word beginning with H would it? I'm looking forward to having a brilliant, compassionate and competent commander in chief for our country! Talk about change! I have noticed that since the Wisconsin primary, the strategy of fear and divisive politics has raised it’s ugly head once again. I’m actually old enough to remember the politics of the 1990’s, and it’s devastating effects on the Democratic Party. The slash and burn Clinton’s we knew well in the 1990’s, have returned “back from the future,” with a vengeance. Every democrat that remembers these political tactics, has to wonder whether the Clinton political machine is trying to re-destroy the new Democratic Party in year 2008. The political team that now claims to “embody” “change,” is seemingly very comfortable using the same old strategy of fear and divisive politics to reclaim their throne in the White House. Anyone truly interested in the future of our Democratic Party has to be very alarmed. The Clinton’s political strategy of slash and burn will serve them well now, but the eventual cost to the Democratic Party will be devastating once again. The same strategy of half-truths, nuance, fear mongering, and divisive ideological battles, that won the Clinton’s the presidency in 1992, and a subsequent New York Senate seat, will cost our national and local party seats and possibly the 2008 upcoming presidential election. The last time we allowed the Clintons to lead our party, we suffered historical political losses, never seen before in American politics. The net result of the divisive, self-serving Clinton political machine of the 90’s, shrank the Democratic Party base, and cost the party control of the United States Senate and the House of Representatives. The sad result of the Clinton politics, and continuous scandals, eventually empowered George W. Bush past the setting democratic incumbent vice president, Al Gore in the 2000 presidential elections. As a result the republicans have took firm control of the United States Supreme Court, appointing 7 of the last 9 justices, currently serving. Looking at the complete picture, I don’t believe that the Clinton administration or politics have lead, served, or is currently serving our Democratic Party well in any capacity. We have to understand, that as a democrats, we have yet to fully recover from the political damage inflicted by the Clinton administration scandals, investigations, and politics during the “1990’s. As a party, if we don’t learn from our past mistakes, and demand a new leadership, we will surely suffer the same devastating consequences in this election year 2008 and beyond. We have to move forward as a party, and turn the page of fear and division, if we are going to expand our electorate and chart a stronger, more inclusive future for this country and the Democratic Party. I would be happy with either Hillary or Obama. We cannot afford another four years of Republican misrule. Our economy is a shambles, and our international prestige is at an all-time low. Were McCain to become president, however, I could at least take solace that he isn't beholden to the religious right. One thing is for certain: neither O'bama nor Hillary will be elected president of this country. Don't get your hopes up. It's not happening. Let's see...we won't have a Democratic President because our country has done so well under George Bush!?? That is almost comical and so absurd it doesn't deserve a response. We are in a recession. People are loosing their homes; not only are they loosing their homes, they are also loosing their lives because they can't afford health care; we are in a war because the president lied and thousands of lives have been lost and billions of our US dollars have been drained from our country to support it; this has ruined our international relations; we are more dependent on oil than ever and the Bush campaign has set back the environmental movement and the possibility of alternative energy sources 50 years; our national debt has escalated to unheard of amounts; during the Bush administration the middle class slowly disappeared as Bush allowed his oil and mining cronies to get richer at the middle class tax-payers expense. And after all of this; Bush is dancing on the steps of the White House like a buffoon. McCain is no Bush but he will continue the same path as the Bush Administration. Is this really what we want for four more years? I would like to have a Democrat as our next president. Another 8 years of Bill Clinton would be fine with me. The problem is that neither of these current candidates have what it takes to be elected. "Anonymous", what were you saying about the economy? Republicans have had control of Congress for the past 6 or 7 years. We've had a Republican Pres. for 8yrs. Wouldn't you think that would be enough time to fix at least some of the so-called problems created by the Democrats? How anyone can be for Hillary, Obama or any other Democrat is beyond me! You must all belong to the " if it feels good, just do it" camp. We can't feel good about ourselves( Americans) because we are a wealthy nation. We can't feel good about ourselves because we have taken the lead in fighting terrorists. We can't feel good about ourselves because we have the best health- care in the world. The list goes on and on. The Pres can do NOTHING. He can only sign or veto bills, or try to push an agenda, but it is ultimately Congress that decides everything! And remember- they are all beholden to special interests and backers, so if you think they really care about the average Joe, think again. All these Demos cries for change! Change WHAT!? Have we been attacked by a terrorist threat again? No! Have the stocks performed well for a number of years, reaching all- time highs? Yes! Have there been tax incentives for people willing to get off their lazy butts and make something for themselves instead of expecting the gov't to dole out money and support them? Yes! Yes, healthcare needs to be addressed, but by who? Congress? Those jokers are so indebted to pharmaceutical companies that they will change nothing on their own. It is Congress to contend with. Do you realize that the vast majority of congree-people are lawyers!? Is that a good thing? They can so convalute a proposal or bill that it is not even funny.Congress is where we need "real" people- ones that can see a problem and fix it. I will always support our Pres as he has made the most difficult decisions that any pres in a while has had to make. Such actions may make him unpopular, but you know what- I feel safe inside my country. And I desire other peoples to feel unthreatened in theirs. Heavy hangs the head that wears the crown. How much better do you think you could have done under stressful and sometimes dire circumstances? Yes, our economy could be better. But the Dems always want to tax and punish the rich, and give away the store to the poor. I say, train the poor to work!!! There is money and good livings out there to be had if the "poor" would quit looking for the govt to bankroll them. It is called enableing. We need to stop it. And we need to educate our people. Hell, look at the mess that comes out of Natchez High. Look at the test scores. Would you hire an ignorant person for your business or one with more intellect? But the Dems can solve it all by makeing us "feel good about ourselves". Nor rich, no poor, health care for everyone, no black, no white, no war, no peace, no right or wrong. Beam me up, Scotty, as there ain't no intelligent life down here. I started not to publish the previous comment, since I specifically said this article was for Democrats, and the author was obviously a Republican. However, I thought he (can't be a woman) is such a perfect example of why the Republican Party is in such trouble this year. I would love to "beam him up", since we'd all be better off. Some of my best friends are Republicans - after all, I live in Natchez. But I like to think they would disown this guy - that they follow in the footsteps of such noted conservatives as the recently departed William Buckley. Anonymous who refers to Chicken LIttle above, you have apparently drunk the Fox News Kool-Aid. The economy is not in good shape - mortagage crisis, stock market plunges, rising oil prices, devalued dollar -- and no serious economist would say so. Mr. Smith, you are eloquent and perhaps right on many fronts. But the issue here is not the prestige and standing of the Democratic Party. The issue is what's best for the country. I am, historically, a Republican. However, there's a 99% chance that I will NOT vote for McCain. I like McCain, but I am disgusted with George Bush and the Republican machine. On the other hand, what would the state of terrorism be on our soil if Al Gore had elected? I have no idea. So, Obama or Hillary? Our country desperately needs Obama's "new politics." But...can such a virtuous guy do the dirty deeds required to put a stop to all the shenanigans that are currently in place? I don't know. Obama's approach is tough love, while Hillary will fight fire with fire. No doubt HIllary is at her best in a "knife fight," as New York Times R-pundit David Brooks wrote this week. In fact, one reporter counted that she used the world "fight" about 36 times in a recent speech. I agree with Casey - a Clinton/Obama ticket would be a strong one. A post-script: Could Obama serve as VP under Clinton for 4-8 years and NOT be corrupted? Yes, the Clinton presidential years were, sadly, scandulous. Neverthess, he was a pretty damned good president and we were all better off for it. Your comment about not publishing one of the articles above is so typical of your style. Casey my Dear, you are clueless! Remember the old adage " .....if I could sell you for what you think your worth.....". Seems so appropriate. Please help me to unblog myself. I can better spend my time watching Looney Tunes! Meanwhile, keep championing First Amendment Rights and trying to hit on just one correct prediction. Have you ever stopped to think that in the last two years that you have never been right on anything you've blogged about. You may want to use some of that marvelous wisdom and insight of yours to evaluate your real self worth as a prognosticator. I couldn't care less if this is censored ...as long as I know that you saw it. There's no way that you have "historically" been a Republican. Give me a break! Who are you kidding?? Maybe you meant "histarically"????? Having read your article carefully, I think you would have to reach way to the "right" just to be able to touch the "far left." You need to find yourself. Whatever was so inspirational that after reading the final paragraph, I feel compelled to stand up and salute......maybe even three or four times! should they make an offer. Conservative Sam is tired now and must go to bed ...goodnight all and I love you! Be a good sport! Kool-Ade or not, the "Chicken Little" guy may be right. "The traditional sign of a recession is two or more quarters when economic activity declines rather than grows. That hasn't happened - the final reading of growth in the third quarter came in at a healthy 4.9 percent." Hillary can't control her husband's fly. So, I'd rather anyone else than her with their finger on the button. Both have a lot of weaknesses as they take on McCain. Hillary may have the better chance. But...it'll be ugly no matter who. (Forget about the super ticket with both) It'll never happen. Regarding the definition of a "recession," I remember just after the current president bush was elected for the first time, he and the former president clinton were interviewed together. The interviewer asked bush how he planned to handle the current recession. He was dumbstruck. He fumbled around and stuttered. then president clinton jumped in and saved him (and himself). Clinton said (paraphrasing): ""The traditional sign of a recession is two or more quarters when economic activity declines rather than grows. That hasn't happened. So there is no recession." Bush smiled blankly. Concerning which party is responsible for our nation's current woes, the Republicans gained control of Congress in 1994 and have been destroying America from the inside-out ever since. For nearly seven years they rubber stamped everything G.W. Bush wanted, changing congressional rules and stifling debate. The reign of the Gingrich/Delay Congress and the Bush presidency have been a disaster for America. I just hope the damage can be undone.